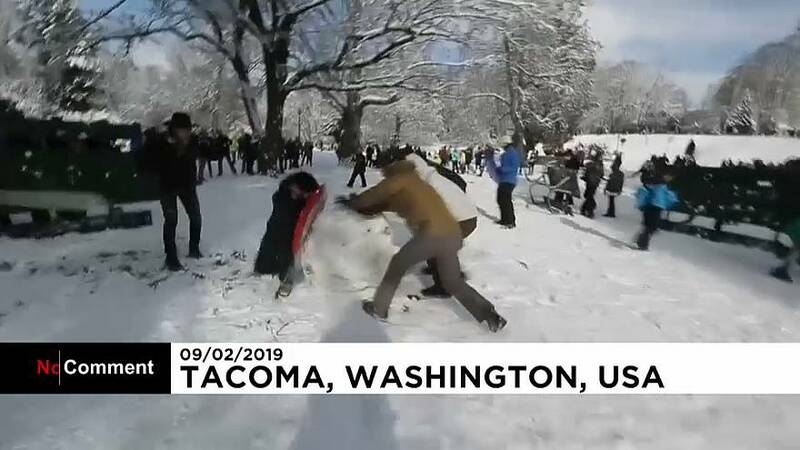 Several hundred people showed up at Wright Park in Tacoma, Washington, on Saturday after local resident Stacy Stevens put up a post on Facebook saying there would be a huge public snowball fight. A large storm system dropped centimeters of snow on Tacoma and the surrounding area, an unusual occurrence for the city located south of Seattle. The post was shared by others on social media and word spread quickly, with more than 3,000 people registering their interest in the event. In an area marked by tall trees near the park's fountain, people of all ages and from different areas of the city converged into two sides and began making and throwing snowballs. People used sleds and even upturned picnic tables as shields. Snowballs were thrown for nearly two hours.